In the past seafarers’ health care could only be assured ashore. But now with the advent of modern communications, care duty to crew can be extended afloat, and can be readily available as an integral part to the ship’s emergency response. With its goal of ensuring that union members receive quality health care, AMOSUP has launched a tele health service for its members working on board. The tele health system service is a facility in partnership with the Seamen’s Hospital to allow seafarers working on board to consult with the Hospital doctors on emergency medical issues. Through the system crew’s medical conditions on board can be managed better and minimise unnecessary repatriation due to medical reasons. Tele health offers assistance to a ship officer – normally through the second officer or ship master – in the diagnosis and treatment of ill or injured crewmembers on board the vessel or offshore facilities where shore-based care is not possible. In the first 15 days of operation since AMOSUP launched the project last June 2016 more than 30 patients aboard have been served, with cases ranging from pains (like ear, chest or back) to injuries due to accidents. Most of the medical cases have been communicated through emails to the Hospital. Ships without email access are provided with the accomplished form that can be printed and sent by fax. If via phone call, the information required is dictated to the attending tele health service personnel on duty. Such information is used for easy verification and record keeping. The AMOSUP tele health service station is located at the Out-patient Department of Seamen’s Hospital which maintains a doctor and a nurse on a three-shift schedule 24/7 dedicated to the system. However, the hospital can augment the manpower based on the volume of emails and calls being received. The provision of long-distance medical care provides an opportunity that can be used to improve maritime health care. In launching the system, AMOSUP and Seamen’s Hospital provide the technology, training, policy and evaluation components. Since it has multiple parts, a programmed and systematic approach is necessary to ensure its success. 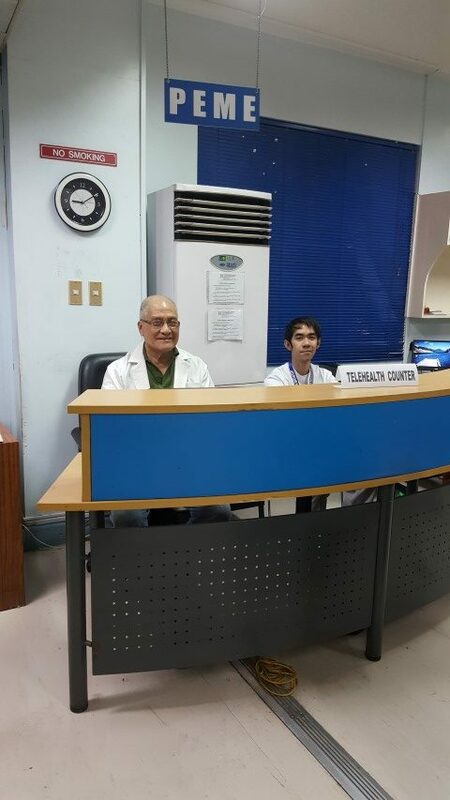 The tele health system has been implemented following the implementation of the ILO’s Maritime Labour Convention (ILO/MLC) and the IMO’s Standards of Training, Certification and Watchkeeping Manila 2010 Amendments. From 1 January 2012, oceangoing vessels and flag states have been required to “provide seafarers medical care as nearly as possible with the care they would receive ashore” and to “ensure by a prearranged system that medical advice by radio or satellite communication to ships at sea is available at any hour of the day or night”.